Pot Marigolds (Calendula officinalis) frame most of the fence border surrounding the Elkus Research Garden. Their cheerful yellow and orange daisy-like blossoms provide beauty almost year-round. Calendula, native to the Mediterranean region, is derived from the Latin word calends, which means the first day of the month, suggesting that as the months passed, calendula remained in bloom. Officinalis indicates that the plant was in the medieval European pharmacopoeia. The common name, marigold, is literally Mary’s gold. Propagation of calendula couldn’t be easier. It grows well in both full sun and part shade. It can be planted in a pot with good potting soil or directly in the ground. The soil should be moderately fertile and well drained. 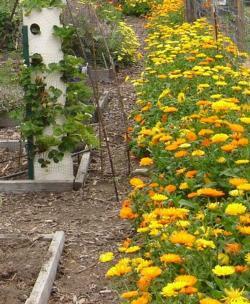 Calendula can also tolerate poor soil, including clay, and survives the cool, foggy coastal summers. In our zone 17 climate it will continue to bloom well into the fall and early winter. Water needs are fortunately moderate. And it is deer resistant. The large curved seeds should be sowed a quarter-inch deep. Germination occurs in 10 to 15 days with 65 degree temperatures, longer if the temperatures are cooler. 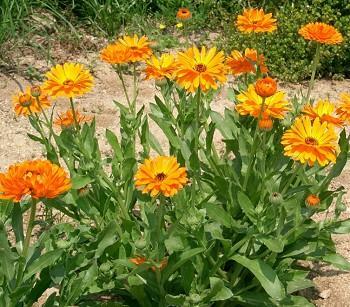 Once calendula has been established, it happily self-sows. The seed heads form very quickly and soon you will have volunteer calendula popping up. 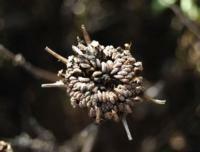 To avoid this, dead-head the spent flowers by cutting just above the next lower flower bud or leaf joint. Leave a few to turn to seed in order to plant in other parts of your yard and share with friends and neighbors. Try transplanting seedlings or even mature plants to a desired location. In the MG demonstration garden we were presented with an entire bed full of volunteer calendula seedlings. We dug them up and transplanted them along the fence line where they grew and formed a lovely border that bloomed for months. Over time, the plants may develop a powdery mildew, in which case they should be pulled up. Besides being beautiful and easy to grow, calendula blooms are edible. I sprinkle the brightly-colored petals in eye-popping salads and mix them into goat and cream cheeses for color. If you want to be a little more ambitious, try making your own healing calendula salve used topically for rashes, dry skin, lip balm and other minor skin irritations. I have used this recipe for over 20 years and it’s easy to make. Collect a jar of calendula flowers and let dry for one day to get rid of some of the moisture. Fill jar with good olive oil, covering petals by more than an inch. Add a few drops of either vitamin E oil or wheat germ oil to reduce chance of mold forming. Let sit in a cool, dark place for six weeks. Occasionally check for mold. Using a funnel lined with cheese cloth, decant the oil. Pour into a sterile jar. Check to ensure the salve has set. If it is too watery, simply put it back into the pot and add more beeswax. If it is too solid, add more oil to the pot. Sometimes I add a few drops of essential oil of lavender for a divine salve. I encourage you to experiment.